Capitalism is a system which feeds off life, the life nature, of human beings; but it does so without the redemption of those sacrificed. Life is expended, but without renewed life. It is a system rather of waste production, the waste of the wealth for the few and the waste of the consumption of this wealth of the privileged. Capitalism is ultimately an economy of death, feeding on the life which sustains it, leaving in its wake immense destruction. The suicide of a spanish mortgage holder, unable to pay his debts, threatened with imminent eviction, is but a living testimony of global violence. That the death by suicide of the neighbor of La Chana José Miguel Domingo is a veritable assassination for which are responsible all of the entities and organiSations that provokes it. This “state terrorism” is being carried out by judicial authorities, by bankers, by politicians and the public administrations of the spanish state. 1. The courts that apply the law without defending the right to a home, excusing themselves with the unjust application of the law, which means that their hands are also covered in blood. If they wished and displayed the most basic sensitivity to the grave dramas that evictions imply, they would apply the law more favourably to the weaker and not favour the banks. 2. Banking entities that independently of the millionaire aid that we citizens all pay with our taxes, extort us, demanding economic conditions that are impossible to comply with because of a lack of money or because of joblessness or because of insufficient income to survive. 3. The public institutions and the politicians, who instead of taking the side of those citizens affected by problems, dedicate themselves to looking the other way, insensitive to the veritable dramas that ever greater numbers of citizens increasingly confront, becoming thereby a real genocide. Statistics indicate that some 34% of the suicides that occur are due to evictions. How many dead, this time not buried in common graves, but in their own homes, does this criminal state need before it impedes evictions? If the public administrations, the authorities, the bankers and the judges excuse themselves saying: “I am fulfilling my duties”, then all of those whose hands are stained with blood, we demand their resignation and that the full weight of the law should fall upon them. We cannot and will not consent to any other person committing suicide; for those responsible, it does not matter, but to us it does and a great deal. It is intolerable that a person is pushed to leave life before the absence of help and of solutions in an eviction procedure, and this just a few hours before he was to be chased from his house like a dog. TO EVERYONE: NO ONE IS TO BE WITHOUT HIS/HER HOUSE. IF THIS IS DONE, THEN WE WILL RETAKE IT. LET US FIGHT TOGETHER ALL UNTILL THE END! 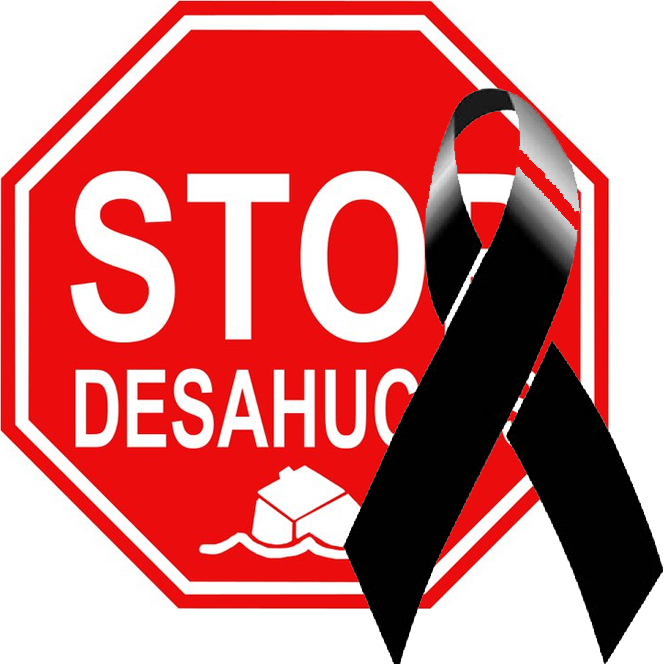 Que la muerte por suicidio del vecino de La Chana José Miguel Domingo es un auténtico asesinato del que son responsables todas las entidades e instituciones que lo han provocado. Este “terrorismo de estado” está siendo protagonizado por las autoridades judiciales, por los banqueros, por los políticos y las administraciones públicas del estado español. 1o.- Los juzgados que aplican la ley sin defender el derecho a la vivienda, excusándose con una aplicación injusta de la legalidad, lo que hace que sus manos estén también manchadas de sangre. Si quisieran y mostraran la más mínima sensibilidad ante los graves dramas que implican los desahucios, aplicarían la ley de la forma más favorable al más débil y no a favor de los bancos. 2o.- Las entidades bancarias que, a pesar de las millonarias ayudas que les pagamos todos los ciudadanos con nuestros impuestos, nos extorsionan exigiéndonos condiciones económicas imposibles de cumplir por carecer de ingresos o por estar sin trabajo o con ingresos insuficientes para poder sobrevivir. 3o.- Las instituciones públicas y los políticos, que en lugar de tomar partido en los problemas de los ciudadanos, se dedican a mirar para otro lado, insensibles antes los auténticos dramas que cada vez más, sufren gran número de ciudadanos, llegando ya a convertirse en un auténtico genocidio. Las estadísticas indican que un 34% de los suicidios que se producen son debido a los desahucios. ¿Cuántos muertos, esta vez no en fosas comunes, sino en sus propias viviendas, necesita este estado criminal para impedir los desahucios?. Si las administraciones públicas, las autoridades, los banqueros y los jueces se excusan diciendo: “cumplo con mis obligaciones”, a todos ellos que tienen las manos manchadas de sangre, les pedimos la dimisión y que caiga sobre ellos todo el peso de la ley. Ante esta situación, que afecta cada vez a más número de familias, realizamos un llamamiento a toda la ciudadanía de Granada para que muestre su rechazo, apoyando a la familia a las 11 horas del viernes 26 de octubre en el cementerio, para a continuación salir en marcha hacia la Subdelegación de Gobierno y concentrarnos a las 12,30 horas. Por la tarde se realizará una concentración a las 19h en la Chana, en la Plaza de las Palomas. No podemos ni vamos a consentir que nadie más se suicide, a los responsables no les importa, pero a nosotros sí y mucho. Es intolerable que una persona se vea arrastrada a quitarse la vida ante la falta de ayuda y de soluciones en un proceso de desahucio y solo unas horas antes de que lo fuesen a echar de su casa como a un perro. A TODOS/AS: ¡NADIE SE VA A QUEDAR SIN SU VIVIENDA. SI NOS ECHAN LA REOCUPAREMOS! This entry was posted in News blog and tagged Okupations, Plataforma de Afectados por la Hipoteca. Bookmark the permalink.